Oakland Mayor Jean Quan vowed to help improve the relationship between city police and journalists during a meeting this week with news gatherers and professional organizations. Photo by Jane Tyska/Media Workers Guild-BANG-East Bay Unit. The meeting, held Tuesday afternoon at Oakland City Hall, was called in an effort to discuss incidents of working reporters and photographers being detained and in some cases arrested by Oakland Police Department officers during several Occupy Oakland protests in recent months. “I think we have OK policies, but can there by improvements?” Quan asked. Representatives of the Media Workers Guild and other groups advocated improvement in Oakland police policies concerning journalists covering street protests after recent detentions and arrests in Oakland. Sara Steffens, a staff rep for the Guild and CWA District 9, at right, was at the meeting with Oakland Mayor Jean Quan, left at head of table. The coalition representing journalists included Steffens, Society of Professional Journalists Northern California Chapter President Liz Enochs, First Amendment lawyer and Northern California Society of Professional Journalists Freedom of Information Committee Co-Chair, Geoff King, and three working journalists. 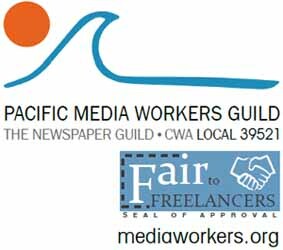 I also was there on behalf of the Pacific Media Workers Guild, Local 39521 of The Newspaper Guild. “We’d love to see a clear directive go out that whatever happens between an officer and journalist, please don’t interfere with our equipment,” she said. Niesha Lofing, president of the Pacific Media Workers Guild, is managing editor of the Sacramento Valley Union Labor Bulletin, a nonprofit monthly publication of the Sacramento Central Labor Council and Sacramento-Sierra’s Building & Construction Trades Council. Raised by Arrests of Journalists are now closed.